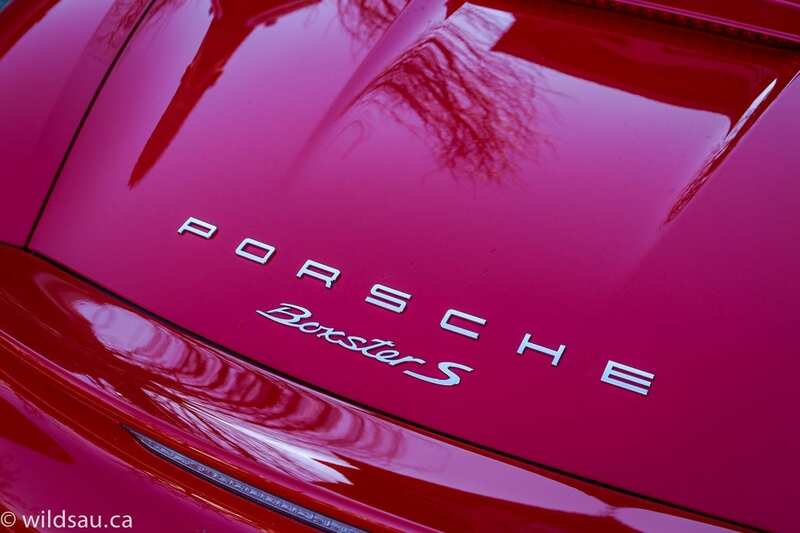 Porsche’s entry-level model, the Boxster, has been blessed with a complete re-do. This radical surgery has been the make-over that much of the tentative fan base has been waiting for. Let’s get this out of the way right now. Whether you liked it or not, and regardless of what it may have been that you didn’t like – the Boxster has always been a great car. It was endowed with a mid-engine design that made for a fantastic handling machine, and in look and feel, it was undeniably a Porsche. Not the prettiest thing in the world, but the package was still very clearly a Porsche. 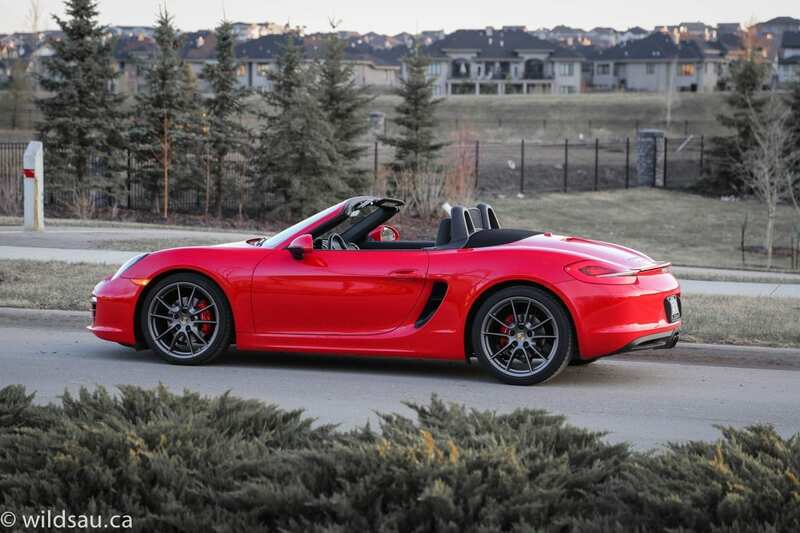 What Porsche has achieved with the all-new 2013 Boxster is nothing short of spectacular – the changes inside and out put this car into a different class in my opinion. As is the case with every Porsche, you are more than welcome to start checking off option boxes. You can add many thousands of dollars by making your bespoke Porsche. 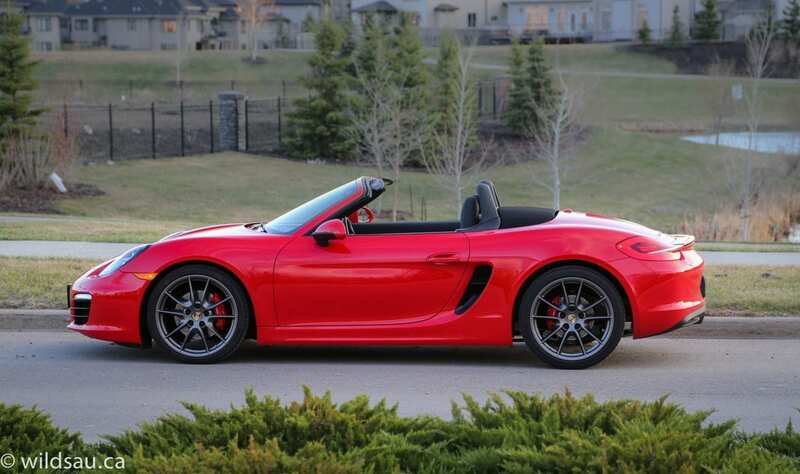 Customizing your Porsche isn’t cheap, of course, but neither is the proposition of getting into one in the first place – the Boxster S starts at CDN $69,500. Let’s start on the outside. Porsche has taken the familiar Boxster lines and sharpened them. New, more angular creases follow the shoulder line of the car from front to back, new air intake shapes gape behind the doors, new front and rear fascias make their debut, new rims fill the wheel wells…. Yes, it’s obvious. It’s all new. 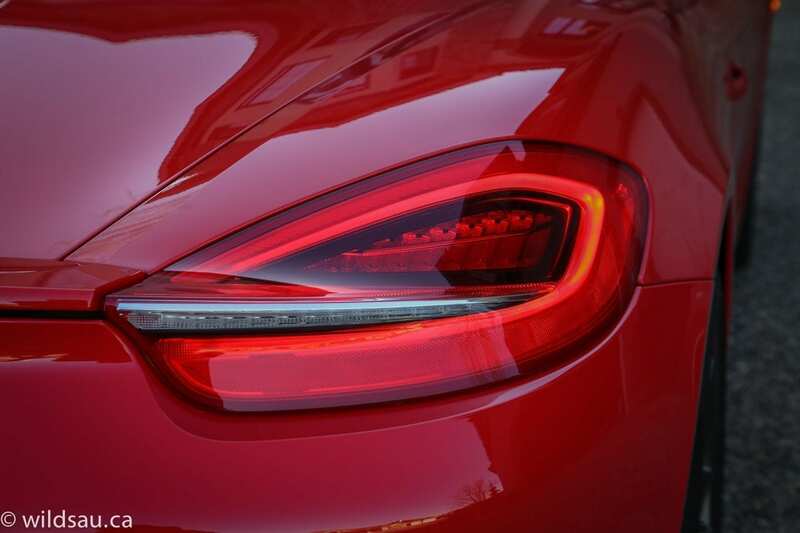 I find that the new Boxster has evolved into a more serious, aggressive-looking automobile – and that’s good in every single way. The little things matter. The headlight cluster is more vertical but stays clean. The rear spoiler is more noticeable but beautifully integrated into a sweeping line and into the taillights. The rims – 20″ in diameter, aggressive and stunningly painted in platinum here – are imposing and shod with 235/35s in front and massive 265/35s in the back. 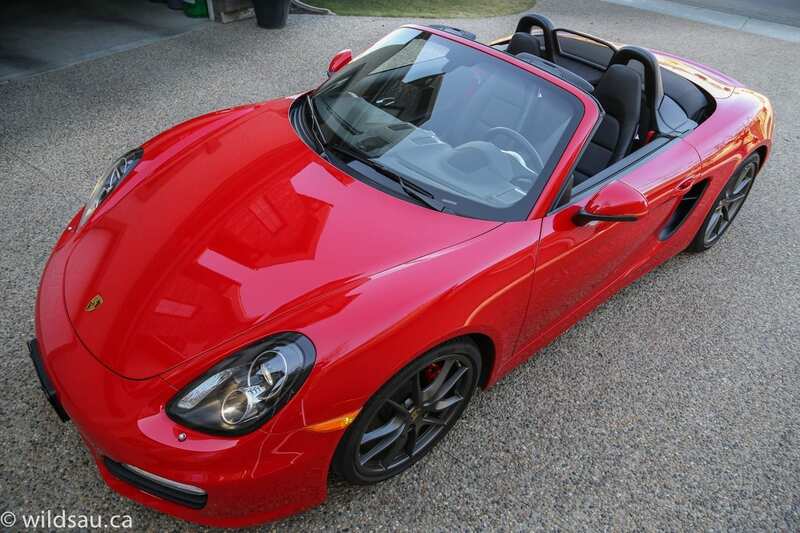 Of course the Boxster is a convertible, and is designed and built around that fact. One thing I was never a fan of was how the original Boxsters looked with the top up. 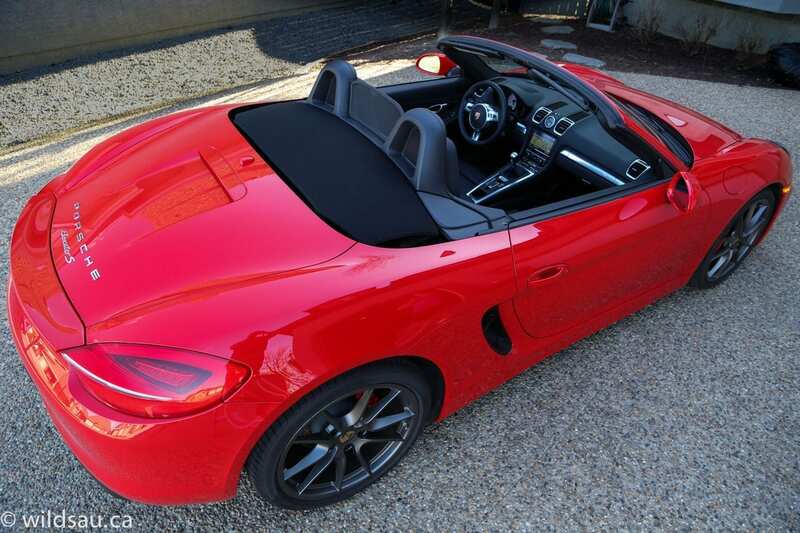 I think the new Boxster looks fantastic – top up or down. Speaking of the top, it’s operable up to 50 km/h, and is well insulated from the elements and noise, using a new mix of magnesium and other materials in its construction, and it’s fast – it takes around 10 seconds to raise or lower. I loved that there is no manual operation or latching required. Hold the switch, and everything is done for you. That’s proper! 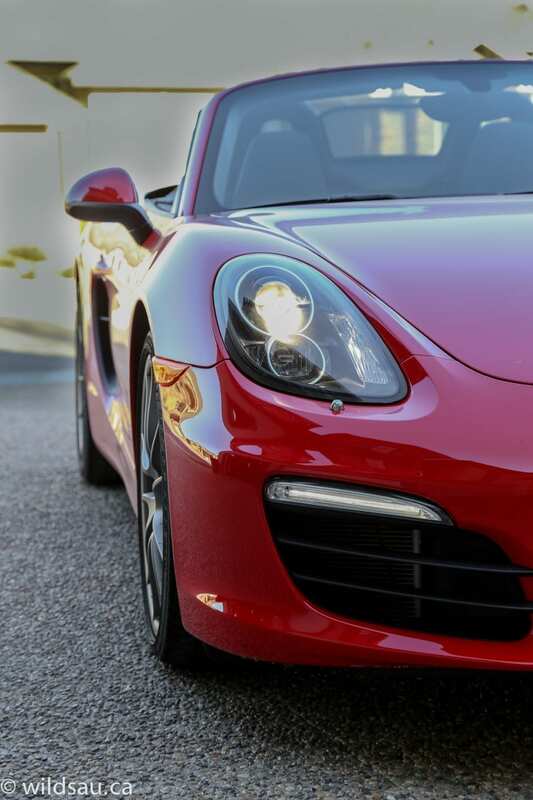 The Boxster S’ 3.4-Litre horizontally-opposed 6-cylinder boxer engine cranks out 315 HP at a heady 6700 RPM. Maximum torque is rated at 265 lb.ft, and it’s available at 4500 RPM. It pulls smoothly from low RPMs, and there’s ample power whenever you breach 4000 RPM. All this juice hits the road through the rear tires, and is channeled through a 6-speed manual transmission. 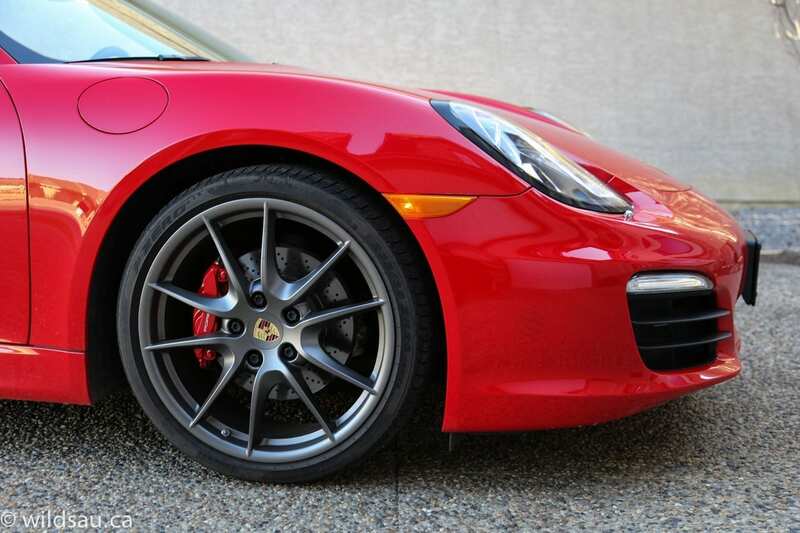 There are less than 3000 pounds of Boxster to schlepp around – 2910 of them, to be exact. Porsche’s legacy has always been to make the most efficient, highest-performing cars in the world. 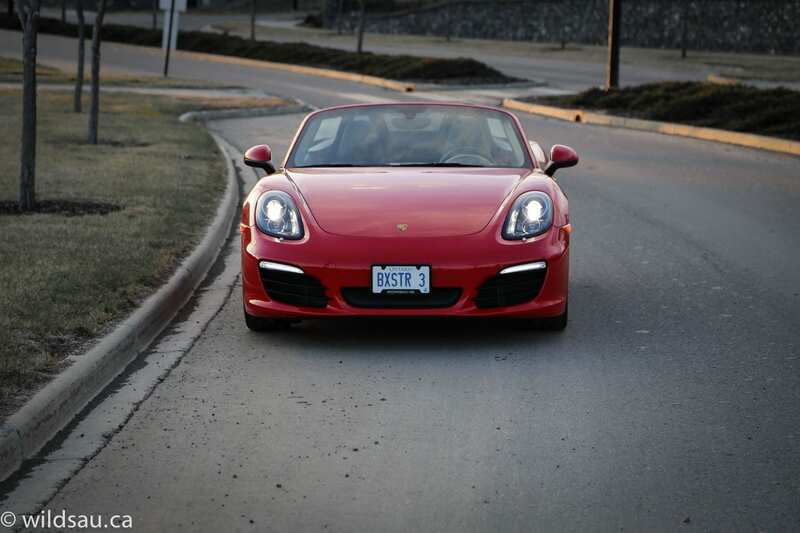 The Boxster S is rated at 10.5 L/100 km (22 mpg) in the city, and 7.2 L/100 km (33 mpg) on the highway. That’s impressive and even more so, considering the numbers this machine is capable of posting at the track, all day long, every day. The tank holds 64 litres and you’ll be putting premium fuel in it. Handling is simply sublime. 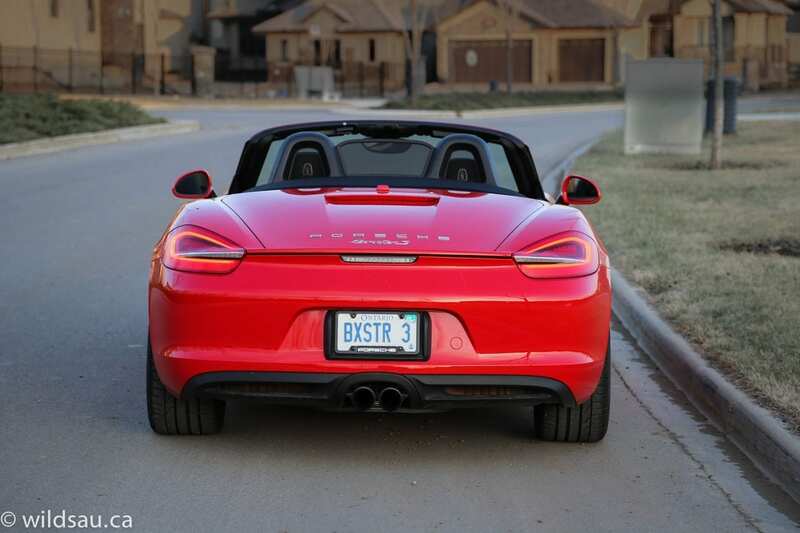 I was able to throw the Boxster S around at some decent speeds – obviously I never approached the limits of the car, but it is truly remarkable how composed the car stays at high speeds, and more importantly, while maneuvering at high speeds. There is no body roll to speak of, and the mid-engine chassis just responds to any command, almost before you give it. The car seems to know what you want to do, it’s seemingly aware of how quickly you want it done, and to top it all off, it’s fully confident that it can pull it off. It’s a wonderful combination of vehicle clairvoyance and ability. It makes you feel as though you’re the most awesome driver there ever was. Even if you’re not. You’ll have a difficult time finding a more balanced car that’s easier to drive. Though it always feels substantial, the light weight of this car is immediately noticeable when you turn the steering wheel. It’s crisp and feels as though it’s rotating on the spot. Do it with speed, and you can steer with the rear end any time you want to. At lower speeds, the regular suspension setting is firm but very comfortable, even over seriously crappy roads (which would account for the majority of Edmonton’s infrastructure). Switch the car to the most focused setting, which is Sport Plus, and the suspension firms up instantly as does the throttle response. As firm as it gets, it still remains supple enough to be more comfortable than many other sports cars I’ve driven. One of the best suspensions I’ve tested. The manual transmission is surprisingly mechanical. The clutch pedal is hard, and there’s plenty of travel. It’s easy to drive though, and clutch take-up is gentle. The shifter’s gate is a bit notchy, but not in a bad way. In a car with significant power and ability, I appreciate knowing I’ve hit a gear properly, and there’s just enough feel below the surface to satisfy that. It’s not as buttery as I’ve found in other cars, but for this application, it’s nearly perfect. With that said, the clutch pedal’s lengthy travel and required effort get a bit hemorrhoidal in bumper to bumper commuting. As I mentioned, it’s got plenty of power, and the power isn’t peaky – it’s softer below 4000 RPM, but it pulls smoothly. As with other normally-aspirated Porsches I’ve driven, the car truly comes alive above 3500-4000 RPM. The sounds are there to thrill you – it’s got a mean bark at start-up – raspier and nastier than you might expect. Let it warm up and it comes down a notch, but never lets you forget it’s ready to rock the Casbah whenever you are. Step on it, and you’ve got the perfect volume level. The mechanical symphony directly behind your ear negates the need to turn on whatever sound system is in there, but if you’re on the gas lightly, it’s a relatively quiet ride and would be just fine for extended highway trips. The chassis on this car is incredibly rigid, especially considering it’s a convertible, and there is negligible flex. The brakes are very well done – linear, easy to modulate, not grabby and powerful when you need to step on them to haul things back down to earth. Visibility of the road for the driver is excellent, framed by the front fenders. Seeing out the back is a different story, with the windscreen behind you getting the in way – that’s when the top is down. When it’s up, visibility out the back or shoulder-checking becomes virtually impossible. This incredibly accessible performance is paired with some surprising utility and efficiency. 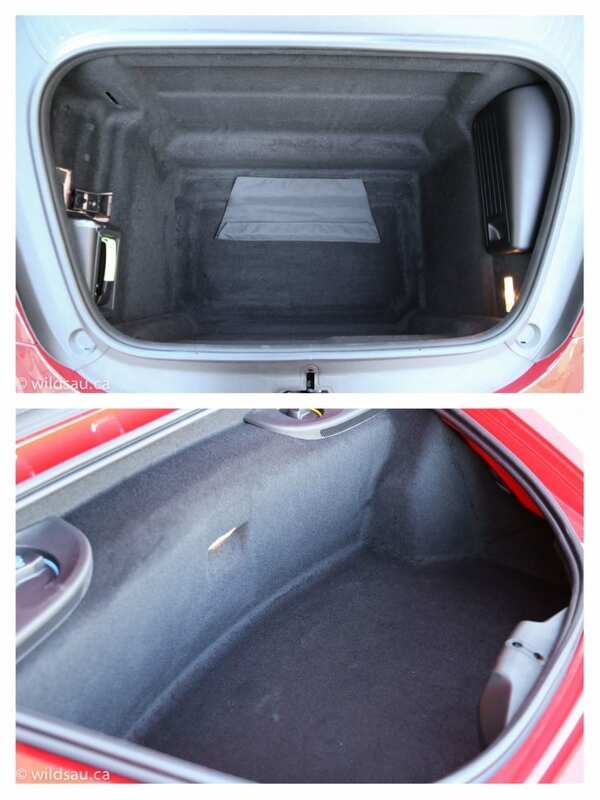 You’ve got two trunks – the deep front well offers 150 Litres and the rear space, more wide and shallower, is 130 Litres. Sprechen Sie road trip for two? 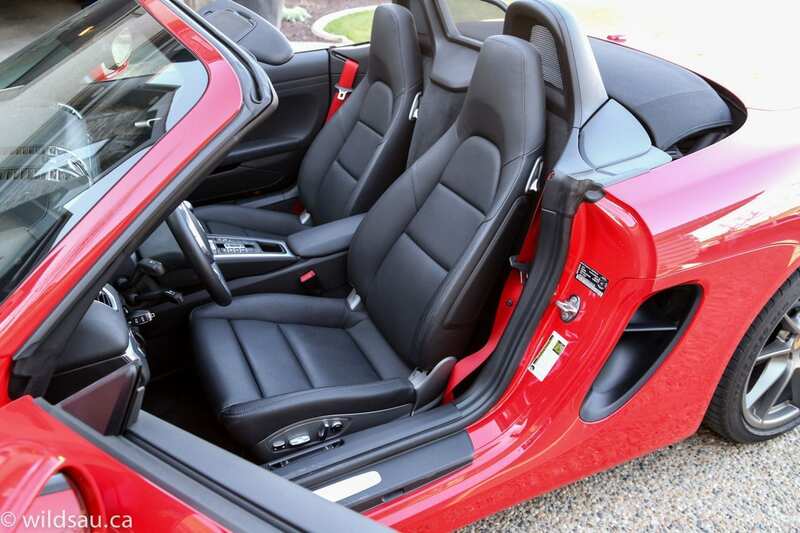 You don’t get into a Boxster so much as drop into one. Once you’re in the seat – which is power adjustable and heated – you’ll find a highly supportive, bolstered seat. I have a broad back, and I actually found the upper shoulder bolsters were a bit restrictive for me, and just too narrow. Porsche’s elevated centre console, which you’ll find throughout the line-up now, shows up here too. 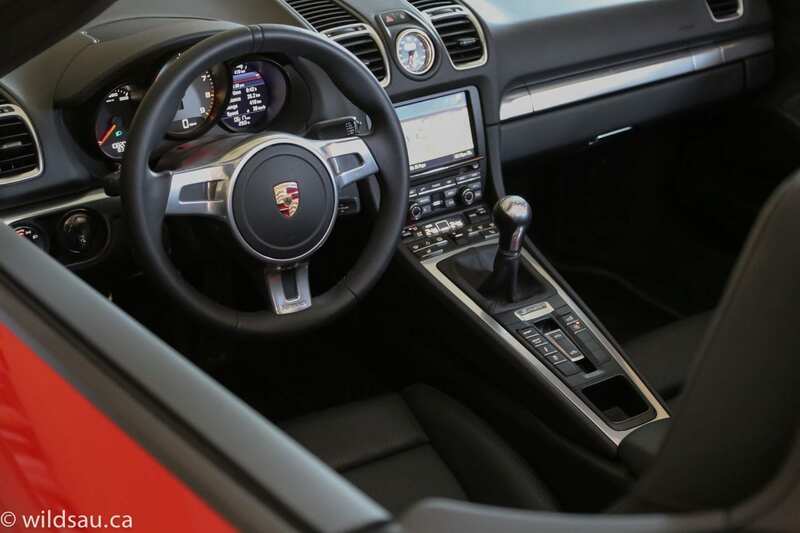 It’s nice to see Porsche remains consistent with their mind-boggling ergonomics – a sea of similarly-shaped and sized buttons abound, and they’re impossible to use without taking your eyes off the road. You’ll find plenty of room for your head and your legs in this cabin – it’s measurably bigger than the last generation of Boxster. 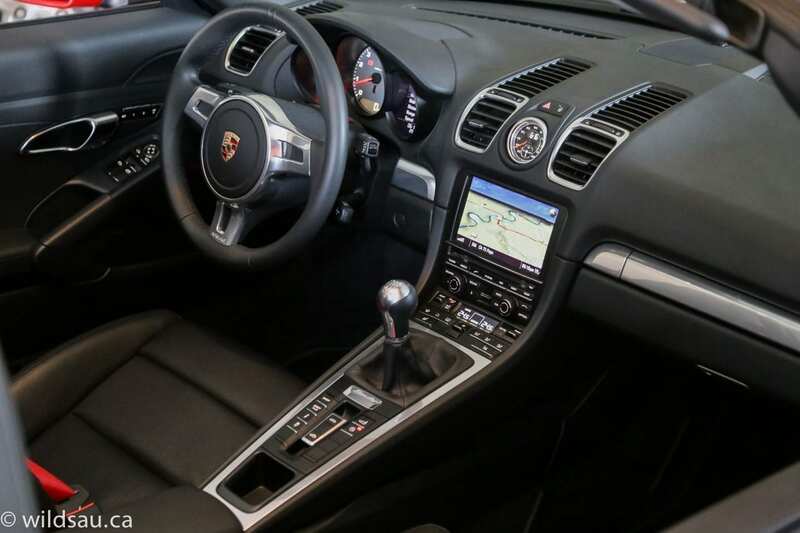 As with any Porsche, the materials are first-rate, the fit and finish is flawless and the cabin, while comfortable and sensibly luxurious, is a model of focus. Exactly what I want in a sports car. So what do you have here? You’ve got a car that is fresh, beautifully sculpted, low, long and stretched out; fast; efficient; comfortable and most importantly, a blast to drive. You’ve also got a car that will encourage you reach for new heights in terms of your own driving, and it’ll be forgiving when you step over your own limits. 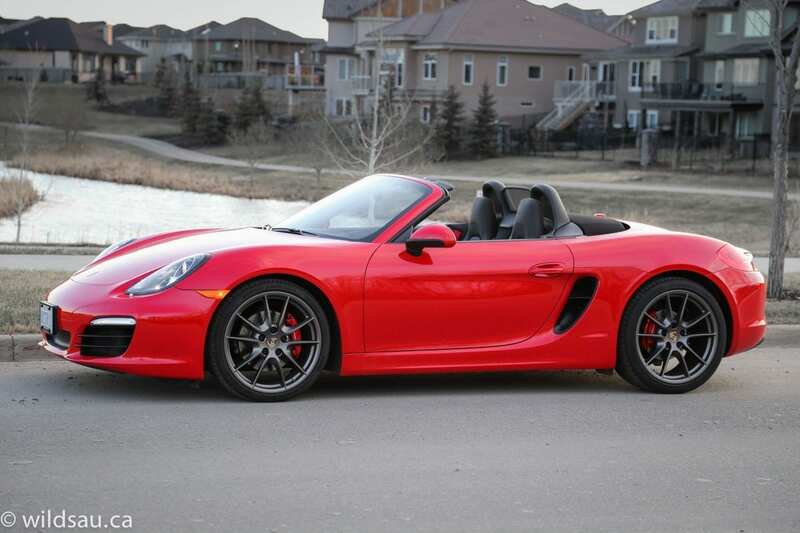 I always said that I would be a bit embarrassed to have a previous generation Boxster. Well friends, the tide has turned. 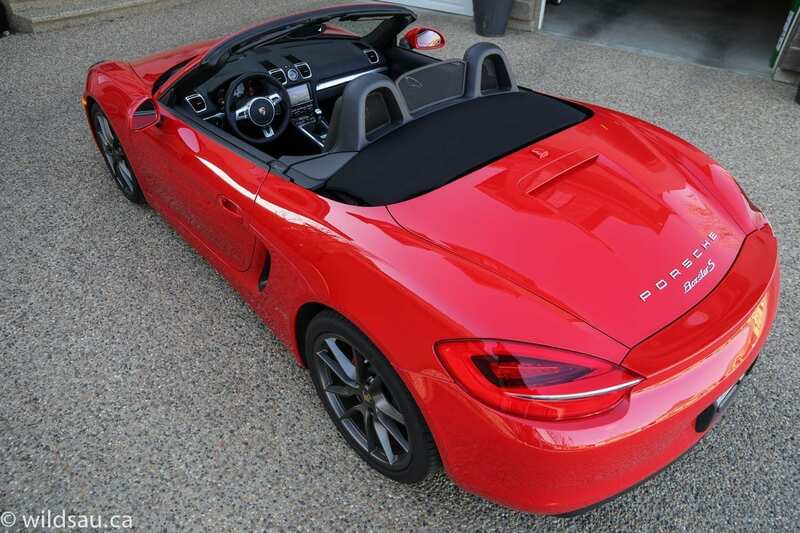 I covet the 2013 Boxster S. I love the dual personality. A car that happily lugs around town at lower RPMs and is easy as pie to commute with. Or a monster that is just as happy to live above 4000 RPMs all day long, and turns into a high-strung ridiculously capable track machine. 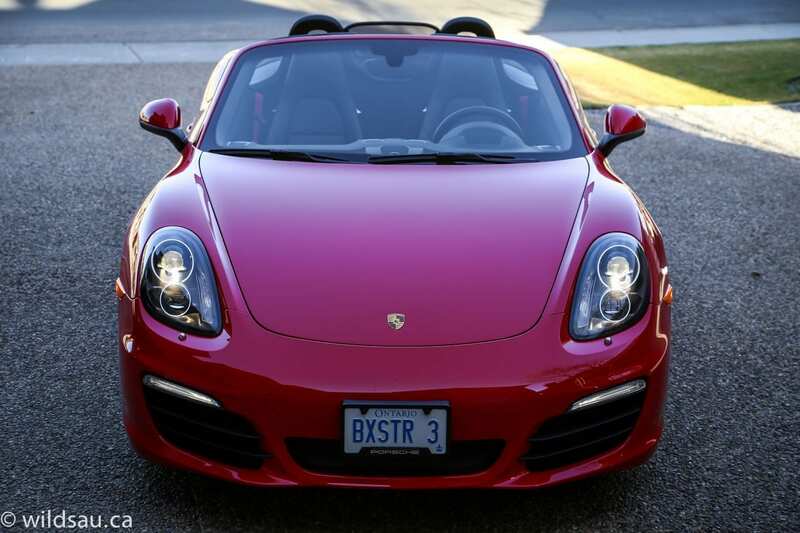 I give the 2013 Boxster S an 8.5 out of 10. 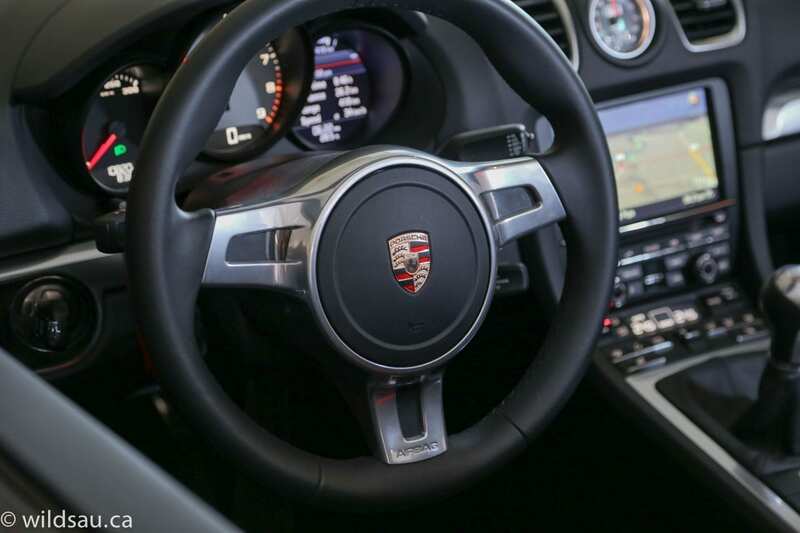 I’ve driven the same car with the awe-inspiring PDK dual-clutch automatic transmission, and I gave that one a 9 out of 10. WAF (Wife Acceptance Factor) comes from the perspective of a passenger. My bride can’t drive manual transmissions and so she was relegated to the passenger seat. She didn’t appreciate that the wind messed her hair up when the top was down, she didn’t like how loud the engine can get under load, and she definitely didn’t like that the trunk space (while fine for a run to the mountains) didn’t accommodate her shopping needs. In other words, this is the perfect car. 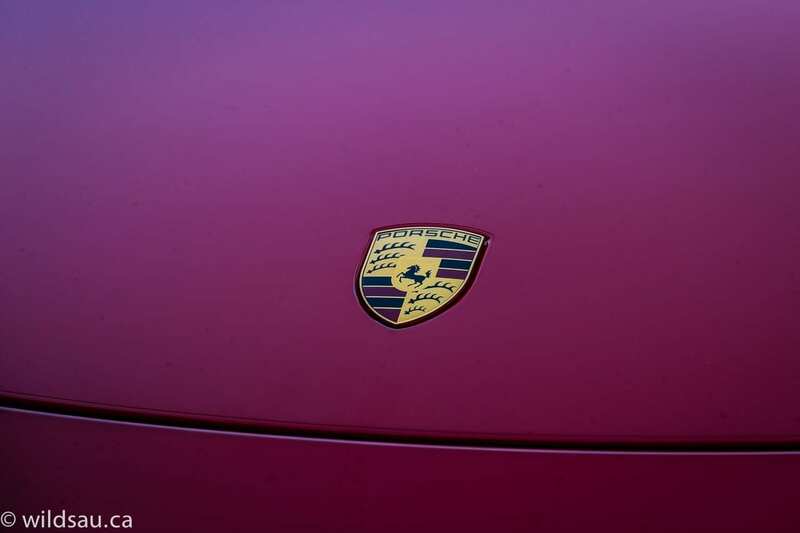 Numbers can never truly convey what a Porsche is really about. The entire driving experience can’t be pigeon-holed into 0-60s and horsepower ratings. And that’s why Porsche continues to move cars that are expensive. Lots of them. It’s because the driving experience is really second to none, and their fabled racing history isn’t just a nice set of laurels they rest on – they build on it, evolve due to it and pass this knowledge, engineering and experience on to the dude who just wants to drive an awesome car. 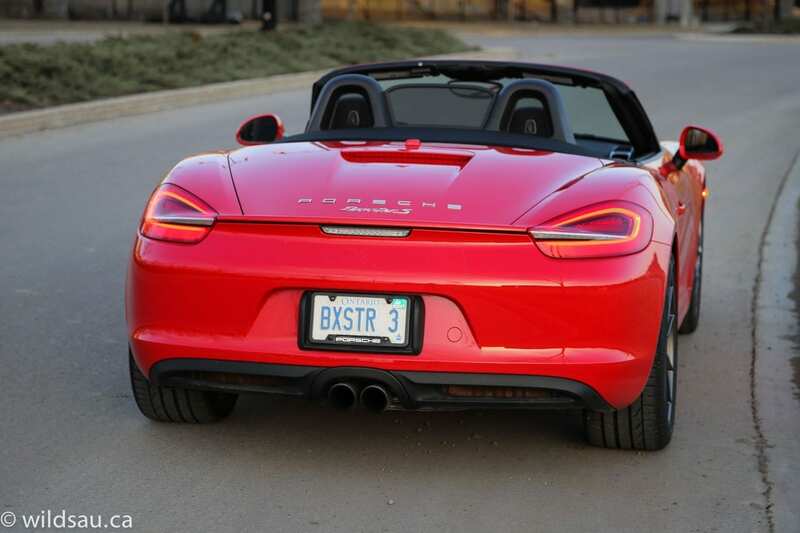 The things they’ve learned in decades on the track have always trickled down to the road cars, and the Boxster S isn’t any different. And it’s better than ever. Did I take a lot of pictures? You bet I did. I loved this car and I loved photographing it.